Amazon.com description: Product Description: Unique among readers in American political and social thought, From Many, One is a broad and balanced anthology that explores the problem of diversity and American political identity throughout American history. From the classic texts of the American political tradition to diverse minority writings, this book offers a wide spectrum of ideas about identity, gender, immigration, race, and religion, and addresses how these issues relate to the concept of national unity. Covering the gamut of viewpoints from majority to minority, from conservative to radical, from assimilationist to separatist, the authors range from the Founding Fathers to Frederick Jackson Turner, from Abigail Adams to bell hooks and Catharine MacKinnon; from Abraham Lincoln to Malcolm X; from Roger Williams to Ralph E. Reed. Sinopoli's extensive introductory and concluding essays set the context for and draw out the implications of the fifty readings. The conclusion includes case studies of three minority groupsÃ¢ÂÂhomosexuals, Mexican-Americans, and Chinese-AmericansÃ¢ÂÂto illustrate further the themes of the volume. Brief introductions to each reading and to each of the five sections provide background information. In examining one of the central questions of American public lifeÃ¢ÂÂthe issue of national diversityÃ¢ÂÂFrom Many, One will be a useful text for courses in American political thought, sociology, American Studies, and American history. 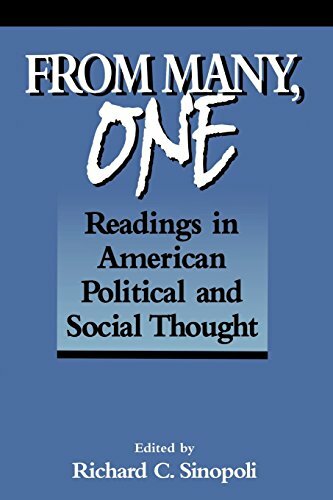 About: Unique among readers in American political and social thought, From Many, One is a broad and balanced anthology that explores the problem of diversity and American political identity throughout American history.